Please pay close attention to this video. Screw it up and you'll have a vacuum leak you won't find for a long time. Exactly what I was looking for. I just might be able to fabricate a tool that will do the job. You make it look easy. Way too much practice. But I need more. GREAT Video! just need to snag up a couple tools and I should have everything for this overhaul. I am here to serve. You're welcome. Scoutpilot.....I was only able to spend a little time today on the carb. I found a nice piece of aluminum bar stock in a drawer that should approximate your snap on tool once I grind it. Unfortunately I also found this pry tool and against your advice and my better judgment --because it's steel--I carefully tried it on this bottom rivet. When it started to gouge the carb I stopped. Tomorrow I'll grind a better tool. I assume the pry edge has to be very sharp to get behind the rivet? I took a closer look at the rivets in my Walck's kit and it looks like they are a smaller diameter than what I have in the carb. Only one appears to be correct. Am I right? Also I see what you mean about the different nozzle styles. My carb appears to have the fully round head but I will confirm it when I get it out. I'm sorry it took so long to get Back with you. The edge is not the most important aspect so much as the flat behind it. 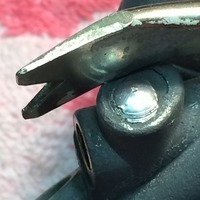 It must e perfectly flat and at a shallow enough angle to allow the split to get behind the head of the rivet plug. Here is a shot with one of the 4 smaller rivets next to my carb. I see what you mean. Hoowee. You may have a problem there. Bubba may have gotten hold of that carb. Only one way to find out...good luck. Yeah. 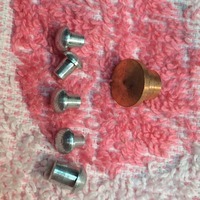 Looks like I only have one rivet in a correct diameter for the carb. The largest one will fit the throttle body of course. Maybe I will just replace one and call it good. I'll think about this a little more. As long as you clean it internally by soaking it in a good carb cleaner overnight, flush the passages with spray carb cleaner, then clean, dry air, then spray brake cleaner through all of the passages (use the plastic tube that comes on the can for both sprays), then blow it out completely by applying clean dry air pressure to ALL openings, you stand a good chance of succeeding. Well I had mixed success. 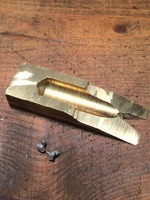 I ground this tool down from a brass bar I had. Got two rivets out easily but the tool is too big to get at the others. I might fashion another one out of a brass drift. On the brighter side the rivets in my kit ARE the correct ones. 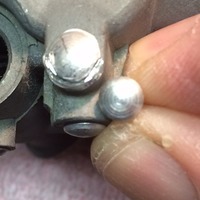 They only looked like a smaller diameter because the head of the rivets in the carb are so flattened out. 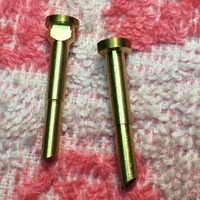 What would be wrong with drilling the other rivets carefully and using an easy out -assuming I don't make another tool? Only you can see the problem up close. That's going to be a judgement call on your part. Is it one of the two I say you should not try to punch? If so, you'll need a very steady hand and a good hold on the main body. Good Luck. Good or bad, let us know how it turned out.